After making this Stuffed Cannelloni recipe I will never use store bought dry pasta shells again. Making your own crepes ( crespelle) for this dish is a lot easier and much better tasting. I normally steered away from making my own crepes until I realized it’s not much of an extra step to make considering the results. Cannelloni can be stuffed with many different ingredients. That’s what I love about them. The last time I made this recipe I put some dried basil in the crepe mixture which gave them an added depth of flavor. I stuffed them with ricotta, asiago and spinach and topped them off with gravy and mozzarella cheese. 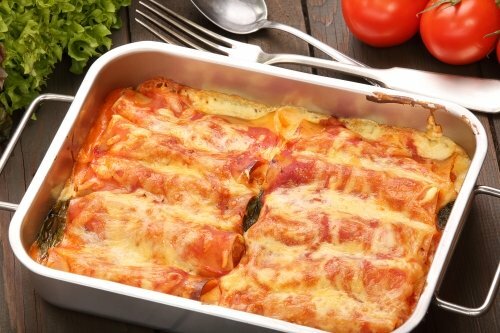 This Stuffed Cannelloni recipe is simple. Other variations, like seafood stuffed cannelloni, can be a little more complicated. Try this one first then you can try stuffing them with chicken, veal, pork, sausage or vegetables. Also besides gravy you can top them with béchamel sauce or a nice bolognaise sauce. They make a wonderful dinner for any occasion. Also lets not forget that plain crepes make some great desserts. in a large bowl whisk together all the ingredients. Grease a small 6-7 inch frying pan with butter. Heat the pan and add around 3 Tbls of the crepe mixture. Swirl the pan around to coat the bottom. When the edges of the crepe pulls away from pan flip with a spatula. Then slip onto a plate and repeat. Thoroughly mix together all the ingredients. Coat the bottom of a greased baking dish with some red gravy. Place the ricotta mixture in the crepe and roll up. Repeat until you use all the crepes. Place the crepes in the baking dish and top with more gravy and mozzarella cheese. Bake for 30 to 40 minute. Serves 4 people and don’t forget the garlic bread.